Two weeks ago (December 22, 2016), Prince Charles warned against state persecution. This is despite the fact that the House of Saud regime he ingratiates himself with as depicted by the photograph above, executed religious leader, Nimr al-Nimr, earlier in the year and is one of the most barbaric regimes on earth. Millions of Londoner’s who are vehemently opposed to the regime have the opportunity to collectively vent their anger at the kind of duplicitous actions of Charles and the British governments unethical and inexcusable policy towards the Saudi regime that seeks to endorse it, once every two years on the streets of the capital. It’s during these periods that the arms fairs which host representatives of some of the most authoritarian regimes on earth gather together in what on the surface might appear to some to represent run of the mill trade shows. It’s the attempt by the establishment to normalize killing and state oppression in this way that’s particularly repugnant. Nevertheless, it’s perhaps fitting that the apex of intra-state violence is not only represented in the home of a former empire that straddled the four corners of the globe, but which also has embodied in its future head of state somebody whose values are inherently inseparable from those he purports to despise. Thus it’s in the home of democracy that such luminaries as Saudi Arabia, Egypt, Bahrain and Azerbaijan are given a welcoming embrace as part of London’s Docklands biennial Defence and Security Equipment International (DSEI) exhibition. Last summer, Britain demonstrated its support for the Saudi government, the biggest market for UK arms companies, by delivering a consignment of 500lb Paveway IV bombs originally earmarked for the RAF, to the House of Saud regime. Saudi Arabia’s fleet of strike aircraft includes British Tornados, Eurofighter Typhoons and US F-15s. “The UK is digging into its own weapons supplies to replenish Saudi stocks,” Michael Stephens, of the Royal United Services Institute (RUSI), told the BBC. Many of the weapons sold to the Saudi’s are being used in airstrikes ostensibly against Houthi rebels in Yemen but in fact are being targeted against civilian infrastructure which amounts to a violation of the laws of war. More than 1,500 companies exhibited their weapons of death wares at the event, including the US and UK giants Lockheed Martin, Boeing, Raytheon and BAE Systems. At past London arms fairs, campaigners have discovered a variety of illegal torture equipment advertised for sale, including electric shock stun guns and batons, leg-irons, and belly, body and gang-chains. There has also been a range of illegal cluster-munition weaponry advertised. Amnesty said it had identified nine companies that had violated UK law at DSEI events between 2005 and 2013. The British establishment and royalty know that arms are good investments especially shells, bombs and cruise missiles that are tipped with depleted uranium. Air, water and soil are contaminated when DU is used, and once contaminated there is no way to de-contaminate it. Contaminating the food chain is a crime against humanity for which the Royal Family is complicit, as it was (with the help of Tiny Rowland), in the asset stripping of Africa. Rowland, who was an unashamed member of Hitler Youth and nicknamed the Royal Buckaneer, was chief executive of the Lonrho conglomerate from 1962 to 1994. Angus Ogilvy, the Queen’s nephew, would sit on Rowland’s Board with Royal approval. The Royal shares would thus finance the arming of Africa in the Lonrho resource wars. African lenders who promised Lohnro their strategic minerals were armed to the hilt by Ogilvy and Rowland. In 1987, the Anti-Slavery Society reported that in Lohnro’s shanty goldmines 60 boys had to work almost naked in a pool of cyanide at their extractor plant in Ghana. The cyanide, in separating out the gold, enters the body as gas, liquid or acid dust. But for Lohnro and royalty such horror is overlooked if it happens to impinge on profits. With the help and advice of their pet buckaneer, the royal shareholder’s had recolonized Africa by the back door and their uranium holdings are now worth more than 6 billion dollars. But here’s the catch. No amount of money can deflect from the fact that pollution is democratic. Not only can uranium winds blow back into the faces of their profiteers, but thanks to uranium investors, radioactive isotopes are now found in the flesh of worms. Worms are a pillar of ecosystems in as much as they air-ate the soil and aid the nutrient uptake of plants which Prince Charles reportedly likes to talk to. Depleted uranium that hardens the tips of shells that can pierce concrete is one of the royal ordinance star exports despite the fact that weapons which contain DU violate the Geneva Convention. The DU shell which the Sovereign has shares in, is not only illegal but it is also a highly mobile discriminate killer described as a “permanent terrain contaminant”. Unlike any hereditary monarchy, however historic, DU stains the environment forever and rewrites DNA codes. The rates of human deformation in Fallujah, the city in Iraq where the West used DU, exceed those in Hiroshima. While the UK government was undertaking its illegal war in Iraq, it increased the value of the Royal investment. The price of uranium increased 500 percent in six years. The trading in death by royalty continues apace but has shifted from the Continent they fleeced during the Ogilvy/Rowland years to the Arabian Gulf Peninsula. BAe systems, Britain’s leading arms manufacturer last year sold 72 Typhoon fighter jets to the Saudi Arabian dictatorship. 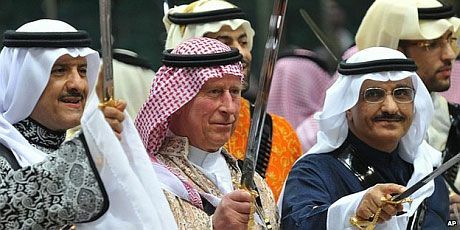 On the eve of the day the deal was signed Prince Charles was in the Saudi capital Riyadh, dressed in traditional robes and joining the Saudi princes in a sword dance. Andrew Smith from the Campaign Against the Arms Trade said “It is clear that Prince Charles has been used by the UK government and BAe Systems as an arms dealer”. This was Charles’ 10th visit to the Saudi regime and was made at the request of the Foreign Office. A previous investigation into UK-Saudi arms deal, Margaret Thatcher’s sale of Tornado fighters in the Al Yamamah deal, was blocked by Tony Blair on “national security grounds”. It’s the hereditary concentration of power and accumulation of wealth through weapons profiteering, corruption and death that is arguably in part the context that explains why the self-proclaimed democrat Jeremy Corbyn refused to sing the national anthem. The monarchy and democracy are simply irreconcilable concepts. It was on this principle that the English people fought a civil war, made a revolution and cut off their king’s head in the 17th century. I’m not suggesting anything of the sort be carried out today, but the inward expression of Corbyn’s republican principles highlight the contradiction at the heart of liberal democratic Britain in the 21st century. …the heart of illiberal undemocratic Britain in the 21st century!!!! !